This meal came about when I was at the market with my children earlier this week. The good canned San Marzano Tomatoes were on sale so I said "Kids-- Spaghetti and Meatballs for Sunday dinner". My son was busy chatting with the butcher and he only heard S-- Meatballs. When he was done with his conversation he came to me and said, "I can't wait to eat Swedish Meatballs". Wait--what?? I thought, "Oh my goodness I haven't made Swedish Meatballs yet this season." Change of plans...tomatoes go in the pantry for another night and I turn my cart around to get what I need for this meal. This meal is a seasonal favorite in our house. From the onions to the pudding cakes, it is just good comfort food. Starting with the sweet pickled onions and cheese--yum, moving on to the savory meatballs in a rosemary gravy--so good, the cabbage and spätzle are a must and the lefse helps mop it all up. But the finisher is the recipe I am featuring today, Sticky Toffee Pudding Cakes. 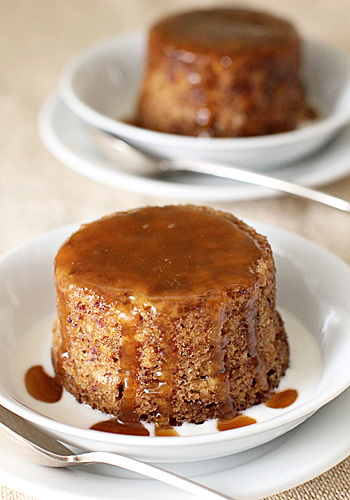 Moist and tender cakes with a sticky toffee sauce served with a ladle of crème anglaise--it is pure heaven. The only change I made is to place all the dates in the food processor. I have kids and they would rather eat dates in small pieces than in big chunks. Other than that, this is a stand up recipe. The pudding cakes are best eaten the day they are made, but the can be wrapped in plastic wrap and stored for 2 days. Just reheat in the microwave before serving. Adjust the oven rack to middle position and preheat the oven to 350ºF. Spray eight 4-ounce ramekins with non-stick baking spray. Set the ramekins in a roasting pan lined with a non-stick baking mat. Bring a kettle of water to a boil over high heat. In a small bowl combine half of dates, water, and baking soda and soak for 5 minutes. Drain dates, reserving liquid, and transfer to a medium bowl. In a separate bowl whisk together the flour, baking powder, and salt. In the bowl of a food processor, combine remaining dates and brown sugar and pulse until blended, about five 1-second pulses. Add drained dates, reserved soaking liquid, eggs, and vanilla and process until smooth, about 5 seconds. With the food processor running, pour the melted butter through feed tube. Transfer the mixture to a medium bowl. Gently stir dry ingredients into wet mixture just until combined. Distribute batter evenly among prepared ramekins. Fill the roasting pan with enough boiling water to come halfway up the sides of the ramekins, making sure not to slash water into the ramekins. Cover pan tightly with aluminum foil, crimpimg edges to seal. Bake pudding cakes until puffed and small holes appear on the surface, about 40 minutes. Immediately remove ramekins from the roasting pan and cool on a wire rack for 10 minutes. In a medium saucepan, melt the butter over medium heat. Whisk in brown sugar until smooth. Continue to cook, stirring occasionally, until mixture looks bubbly and puffy, 3 to 4 minutes. Slowly pour in cream and rum, whisk just to combine. Reduce the heat and simmer until frothy, about 3 minutes. Remove from the heat, cover and keep warm. Set aside. To serve, invert each ramekin onto a plated or shallow bowl, remove ramekin. Serve with the warm toffee sauce, crème anglaise or a good vanilla ice cream. Serve immediately. Enjoy! Oh sticky pudding, I haven't had these since I was in England last, my aunt makes them whenever we are there and they are so good. I can't wait to try your recipe. Thanks so much. Hi Nicole. Saw your photo on foodgawker. Love the photo and the recipe looks great. I didn't know what sticky toffee pudding was until a few years ago when I cooked for English clients. I've not made it, but looking at your recipe, I definitely will! Thanks for posting! Hello and thanks for stopping by! I have been making this recipe for over five years now and it never fails to impress of satisfy. It is delicious, decadent and I love the individual portions. I hope you do try it. Oh man! I LOVE sticky toffee pudding! The serve it a lot at pubs in England and when I was there...I couldn't get enough of it! I vacationed in England during college and I think that is where my love of Sticky Toffee Pudding began. It is sooo good. Unfortunately, there were only three leftover puddings from last night so we had to share between the the five of us tonight--I only got a bite:( Luckily I have more dates. Time to make another batch!